‘Friend and stranger, young and old, all are welcome here. Everyone is very welcome to attend any of the above services. 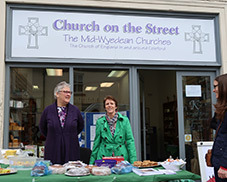 We will be serving Coffee, Tea, Cakes and Scones, cream and jam and offering a quiet space at Church on the Street at this weekend’s Coleford Music Festival. Please pop in to say hello and enjoy some tea and cake! Steve will be open at King of Kings Christian Bookshop and Rachel will be selling her Fair Deal Locally produce. The Inaugural meeting of the Friends of All Saints Church, Staunton will take place tomorrow evening at 6pm at Staunton Village Hall. Come and see the proposed plans for repair and improvement for the Church. All welcome. Our service on Sunday 1st July is the United Parish Service @ 10.30am at St Peter’s Church, Clearwell where we will be celebrating St Peter’s Day. Please come along and join us and stay for some light refreshments after the service.